My first thought when I had a whiff and a sip of this wine was, “Damn this is a well-made Syrah”. This is fabulous stuff and another great example of why cool-climate Syrah grown in the Northern Rhone is where it’s at. On the nose this wine is dusty violets and olives and herbs. There’s a bit of orange zest even and pretty licorice. The mid-palate is full bodied but with great balanced acidity. Wow this is a nice wine. A wonderful finish too, not much tannin, and nicely integrated with the rest of the wine. 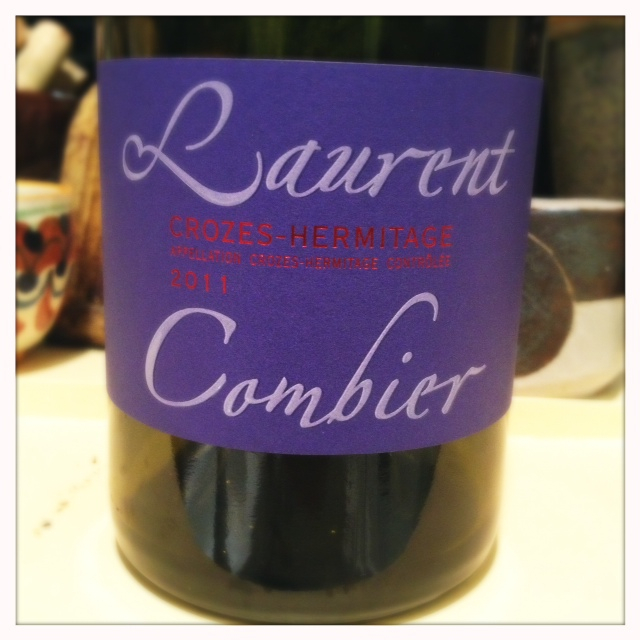 The Laurent Combier winery has an interesting story. The Combier family were organic fruit farmers in the 1970’s (when nobody else was) who grew grapes until the son of the family, Laurent, who had studied both viticulture and agriculture at the university in Orange refocused the farm and made it more of a viticulturist family who grew apricots and peaches. They expanded their grape growing and now are about 19 hectares of wine and about 20 hectares of mainly peaches and some apricots. The grapes are brought in and go through a 25 day maceration in stainless steel tanks and then eventually are transferred to either concrete eggs or into neutral oak. The result is a pure fruit wine with beautiful body and acidity. In keeping with their organic philosophy, the wine also sees very little sulphur. This is just a deliciously pure Syrah and one that I will seek out again, especially if I can continue to find it for less than $20. This is a wine that on the nose just screams old world Syrah. It’s got a rustic edge to it with a lot of minerality. On the palate it’s just a tad juicy with dark fruit and hints of tobacco, and has a full mid-palate with some tannins on the back end. 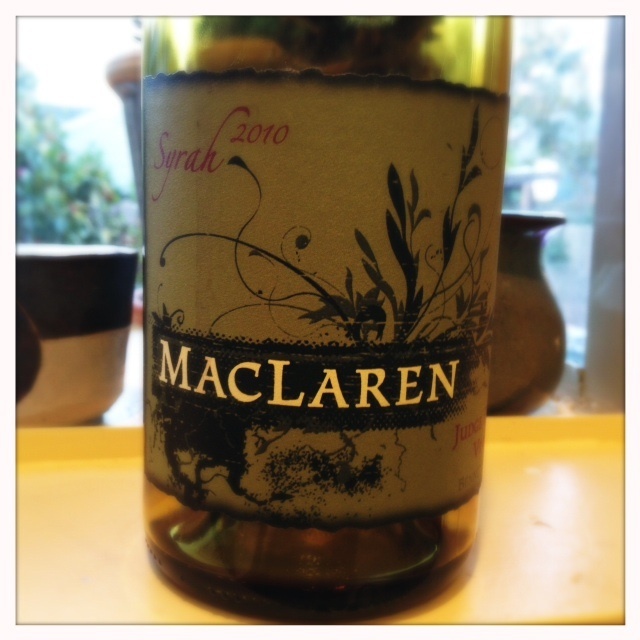 The acidity spikes and makes the wine finish a little like biting into a tart orange. This is a wine that might be best suited for big food like steak or sausage but would also work with pork or chicken dishes with a rich sauce. The Vin de Pays des Collines Rhodaniennes Syrah is Cuilleron’s entry-level Syrah and comes from the village of Chavanay where his headquarters reside. Chavanay is in the more up-and-coming area of St. Joseph. The vineyards for this wine are farmed naturally, if not quite organically. 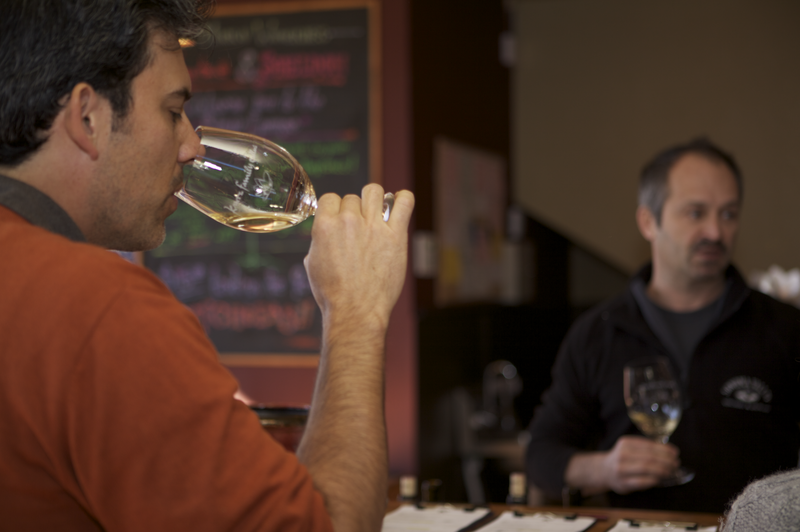 The grapes are de-stemmed, fermented in open vats and go through a two-week maceration process. The wine is aged for eight months in oak. According to my Northern Rhone bible The Wines of the Northern Rhône, Cuilleron has drawn a lot of attention to himself because of his modern wine making although Livingstone-Learmouth thinks that Cuilleron gets considerably more “flamboyant” in his winemaking with his whites. 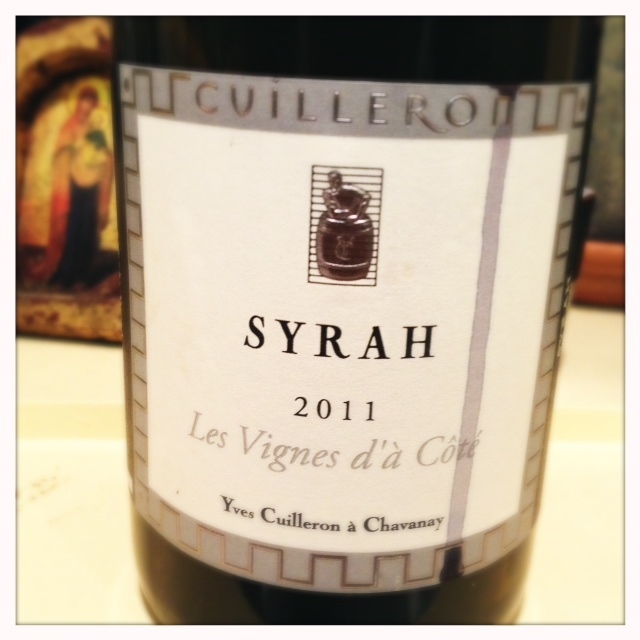 I look forward to trying more of Cuilleron’s Syrahs as I continue to explore the Northern Rhone in more depth. For an “entry level” Syrah this is definitely a wine to find and enjoy and for less than $20 it gives a great introduction into the world of cool-climate Syrah. The truth is that as I begin to peel the onion that is French Syrah, I’m finding out that it’s going to be a slow process. My notes for the French Syrahs are going to be a little more heavy on the tasting notes rather than the back story of the winery simply because of how far away I am from the story of these wines and how little I’ve researched them so far. That will all change as I find out more and more. Perhaps a trip to France in the future? Now, you may wonder how the hell am I not an expert in Northern Rhone when I profess to be extolling the virtues of cool-climate Syrah. Well, while I have drunken quite a few of these wines and have a good sense of their flavor profiles, I don’t know that much about the specific producers or the story behind them. The price point for some of the Syrahs has also been a factor in scaring me off. But now, I’m delving in, with an eye out for some not-so-expensive iterations. Please stay with me as I learn more! Well, bring on the insanity. This is my style of Syrah. It was grown in the Bennett Valley appellation, which lies between Glen Ellen and the west side of Santa Rosa. There are areas of Bennett Valley where the Syrah grapes barely reach ripeness and, in fact, some would say would be more suited for Pinot. (I don’t agree.) I’ve had a few bigger styles of Syrah from this area but also a few elegant and savory Syrahs that scream cool-climate. The Judge Family Vineyard Syrah from MacLaren is a great example of how Northern California Syrah, when grown in the right environment, can reach the same heights as Northern Rhone Syrah. This wine is really a dead ringer for a Northern Rhone Syrah – it’s got textbook bright plum, black olive and floral aromas. There’s a lot of fresh fruit on this wine; this is not a jammy style of Syrah, which is something Steve Law is very proud of. There’s also a lot of minerality and a very savory edge, almost like a salted plum. The mid-palate is bright and transitions to a nice lift of acidity on the finish. There is very little evidence of tannins on this wine and that’s exactly what Steve was trying to achieve. This wine is up there with my absolute favorite Syrahs that I’ve tried for this blog. 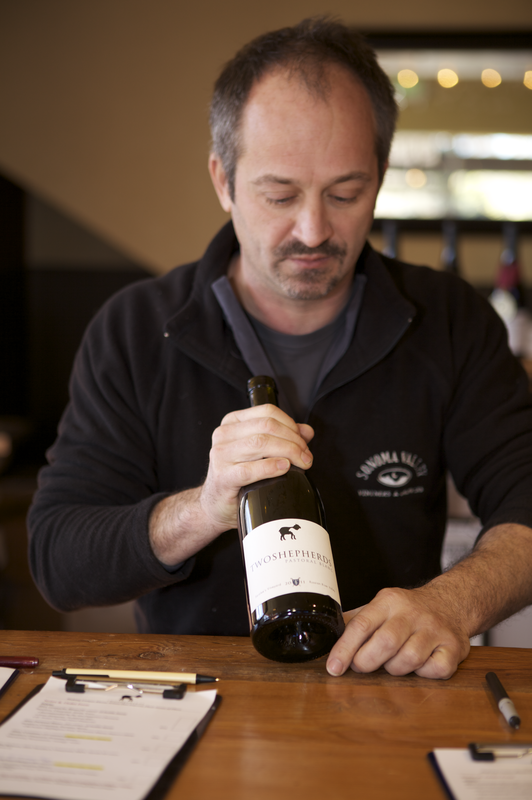 Steve Law moved to California after living in France and working in the electronics industry for twelve years, a time he also spent drinking and eating and falling in love with Northern Rhone Syrah, especially St. Joseph. In coming to California he began exploring wine areas and developed an affinity for the Healdsburg area. He began to volunteer for Michael Talty at Talty Winery and eventually convinced Michael to let him make a barrel of wine in 2007. Steve wanted to make Syrah, and he got some fruit from a winery down the road and made it in a style that’s more associated with the Dry Creek Valley Syrah – big, tannic, and fruity. Steve told me the wine was actually received well but he never liked it himself; it just didn’t remind him of the Syrah that he had grown to love so much in France. After some lucky conversations with two of Steve’s favorite Saint Joseph winemakers, Yves Cuilleron and Francois Villard, Steve realized he needed to find cooler climate grapes and to pick a tad earlier. He also needed a way to de-emphasize the tannin but emphasize the acidity. Steve is passionate about the important distinction between these two red wine characteristics. Big and tannic wine needs fatty food to cut through it and Steve wasn’t interested in that. He was impressed with how the Syrahs he’d had in France and specifically from Saint Joseph were not huge tannic bombs but rather, elegant wines that went just as well with meat dishes as they went with fish. He felt that the key to making a wine in this style was to deemphasize the amount of extraction from the skins. The skins in grapes are what carry all the tannins and when punched down heavily or pressed at high pressure those tannins result in a bigger and blockier style of Syrah. Steve solves this problem by pressing down the grapes with a bladder press at a very light setting. This light pressing extracts the beautiful flavor, aromas and acidity of the Syrah without giving him all those beefy tannins. It also results in getting less juice per ton than many other wine makers. But Steve is ecstatic with the results. And he has a right to be. This Judge Family Vineyard Syrah is my favorite in Steve’s lineup (you can see some of my tasting notes from his other wines here). It’s a wine that much like the Two Shepherds Syrah could easily go with light food. In fact, I drank a few glasses with an egg and vegetable scramble and the wine went spectacularly well with it. As Steve said, you can save the jam for your bread and butter in the morning because it doesn’t belong in your wine. I couldn’t agree more. A nice long desert vacation and the start of the SF Giants season has left me a little behind in wine posts but I wanted to get back in the swing of things with one of my favorite California wineries to come about in the last few years. The Two Shepherds Saralee’s Vineyard Syrah is everything I love about well-made cool-climate Californian Syrah. It still has that bright and deliciously pure California sunshine-y fruit but it also has some savory and secondary aromas that give it complexity and interest. On the nose, I get some aromas of fresh plum and strawberry and a fair amount of minerality. There are hints of anise in the background too. The mid-palate is elegant and has a great combination of body and acidity. The finish is beautifully bright and savory and hints to the aging potential of this wine. Like many of the cooler climate styles of Syrah that I’ve tasted for this blog, it’s a red wine that would go well with lighter fair. You don’t have to wait until you barbeque a steak with this Syrah, it’s ready to drink with your roast chicken, even salmon, or (at least in our house) the ubiquitous sautéed chicken breast. Two Shepherds is the love child of wine blogger William Allen. Allen started the Simple Hedonisms wine blog in the mid 2000s and eventually decided to “…put his money where his keyboard was by planting a vineyard and starting a micro-winery.” He moved up to Healdsburg to make wines that he felt celebrated California fruit and weren’t masked with oak and unnecessary additions. 2010 was Allen’s first vintage under the Two Shepherds label. Allen is not a natural winemaker but he does believe in a minimalist approach. Keeping the wine in neutral oak barrels is an integral part of his approach to winemaking because Allen feels that the wine gets body from the oak but doesn’t develop any of the oak flavors that mask the fruit. Allen attributes his revelation as to how good California wine could be by having tasted a Grenache Blanc from Paso Robles winemaker Anthony Yount. The Grenache was treated in a way that gave it body but also made it light on its feet and balanced for his palate. In an email to me Allen described why he liked the wine so much, “It was the fact that the Grenache Blanc was made in a style that was both textural and complex, as well as bright and acid driven. Most California Grenache Blanc is either bright and linear, or over-ripe and flabby. When it became hard to find many others doing similar, it became one of the cores of Two Shepherds.” That one wine became an inspiration to him and set him forth on a path to explore how he could make wines with California fruit that also bridged the gap between complexity, body, and acidity. 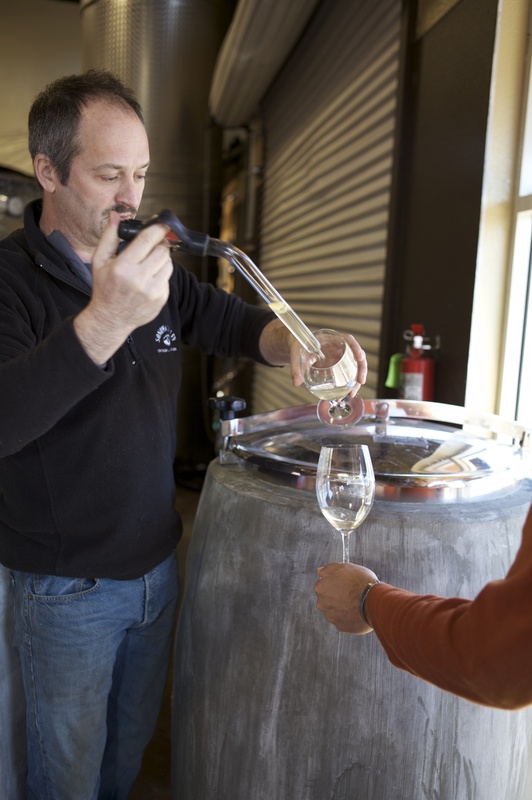 On a recent visit to Two Shepherds Winery, Allen was excited about his new concrete eggs that he hoped would give him another way to ferment the wine without imparting extraneous flavor. Allen is zealous about his wine and gave us a great tour of his small operation. What I find most interesting and exciting about his wines is that they are so different from many of the California wines that exist these days– the higher acidity and elegance combined with the texturally weighty body illustrates how William was, in fact, able to achieve that goal that he set for himself. I’ve had other Syrah from Saralee’s vineyards and this wine is unique. Although he focuses on Rhone varietals, William will be making some Cabernet Franc in the coming year to show how his house style can elevate its somewhat suspect reputation in California. It was a pleasure to taste the Two Shepherds Syrah and I can’t wait to see how this winery will develop in the future. The combination of acidity and body is a rare and special one in many California wines and one that I am constantly looking for. I’m glad to have found it. This wine was provided as a media sample. Thank you to Rick LaRocca for the wonderful pictures.